In the world the consumption of a healthy diet is essential to prevent diseases such as obesity, diabetes and brain diseases. New discoveries in medicine indicate that a diet that is low in fat and carbohydrate lower the blood bacteria and fungi end products with low blood cholesterol and toxic proteins such as amyloid beta that are broken down by the liver (Fig. 1). The timing of food ingestion in the morning or the evening will determine the fast breakdown of cholesterol and toxic amyloid beta proteins with the brain cells still young and alive after many years. When we consume alcohol with age the young cells become old and the bacteria and fungi end products are not broken down by the liver and the brain becomes old and dies. The brain centre of the cell is called the nucleus and is important to keep the cell alive but when fat, alcohol and bacteria/fungus end products are eaten the cell changes and the body cannot breakdown the end products, fats and carbohydrates. The diet that is healthy will not increase the bad blood cholesterol that leads to a heart attack and stroke. Food and nutrition guidelines for handling and processing of fresh fruit, bread and vegetables are essential and fresh produce may require cold preservation procedures to prevent minimal bacterial and fungi contamination of food. When we consume a fat diet the content of the bacteria break down products called lipopolysaccharides (LPS) are absorbed into the blood and increase the bad cholesterol and liver disease that is a major disease in the world and is called non alcoholic fatty liver disease. 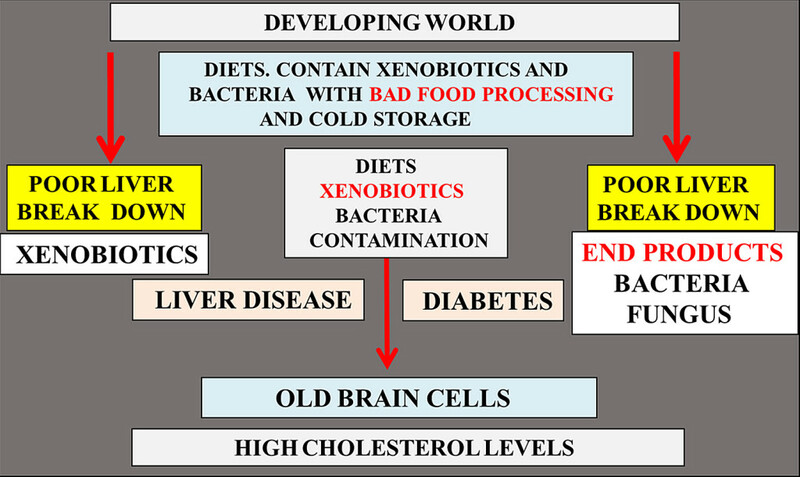 In developing countries in recent years the increase in foreign compounds such as xenobiotics (food, air, water) in polluted environments (drugs, drug metabolites, synthetic pesticides, and herbicides) may compete with bacteria/mycotoxin end product break down by the liver and the both the xenobiotic compounds and end products may cause the liver and the brain to die as liver disease and diabetes in the developing world (Fig. 2) has increased to epidemic levels. Cold preservation procedures in the developing world such as fridges and freezers are required to prevent minimal bacterial and fungi contamination of food with proper food preservation. The fungus end products called mycotoxins in the diet can also be absorbed and change the cholesterol breakdown in the liver. End products such as mycotocin ochratoxin A found in coffee and patulin found in foods such as apple, blue cheese, cereals are poisonous and cause the brain cells to die. Bacterial end products such as LPS found in cheese, fruit, and vegetables cause the body to change and become diseased and cause the body organs to increase the bad cholesterol. 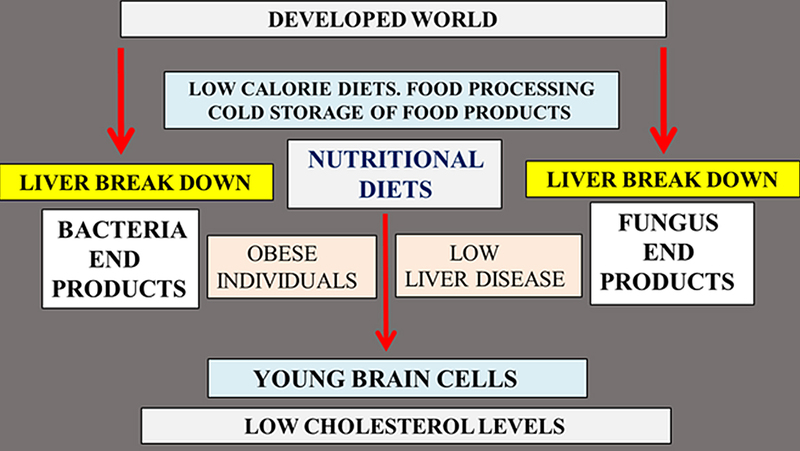 Western diets with high calories stop the breakdown by the liver of the bacterial and fungi end products. The break products when eaten with Western diets make the young cells old and the cells then cause many diseases such as obesity and diabetes. Strict surveillance of apple ripening and cheese making/ripening have to be implemented to ensure toxic patulin levels are low with increased levels associated with the ripening and aging process. In the developing world health and hygiene standards are essential with hand washing and personal hygiene important to prevent bacterial contamination. Microbiological contamination of water has raised concerns with bacterial end products involved in various chronic diseases. Patulin is used as an antibiotic in the developing world since antibiotics do not work any longer with antibiotic resistance. Doses of patulin should be carefully monitored for consumption since patulin is present in food products. Overnutrition Determines LPS Regulation of Mycotoxin Induced Neurotoxicity in Neurodegenerative Diseases.